Racketboy Genre Guides Organized – What Should We Do Next? For the last year or so, the Racketboy writing team and I have been working on building a nice collection of genre-specific guides to compliment our platform-specific entries. However, up until now, it was a challenge to find them all in our archives. 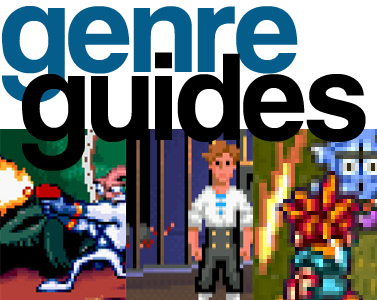 However, I finally have a nice page dedicated to our Genre Guide Collection. This page should be a great place to go to when you want to expand your knowledge or your collection of a certain genre. If you have any other thoughts or ideas, please feel free to share them in the comments section below. I don’t know if it’s within the scope of this site, but a “best game hacks” for each system guide could be pretty cool…I know there’s some out there that are awfully polished (i.e. Mario Adventure). What about most expensive games for GBA? Hidden Gems for every Genre! I love your hidden Gems articles; keep ’em coming. We need more LOVE for STRATEGY GAMES! Preferably SRPGs (Strategic RPGs) a la Tactics Ogre, Front Mission, Fire Emblem etc. I love reading your articles. Do them all! I was one of the people who questioned Racketboy (If you want specifically Twitter) what with the guides happened and it seems our questions are answered. Meh, RPG’s are way overdone and way overrated now. I want to see some adventure game 101! I’d say shmup hidden gems and horror hidden gems would be pretty cool. go for the hidden gems! i personally discovered some only thanks to you guys, go on! I’d love to collaborate with someone on Survival Horror Hidden Gems.